Everyone seems to be thinking about the future. Newspaper publishers, book publishers, booksellers, journals publishers, and of course librarians too are all looking anxiously at what the future may bring. We fear, no doubt with good reason, that as the music business went so may we. The digital world offers some amazing possibilities: Amazon promotions of ebooks can result in huge sales. Discount the price of your book to $1.99 for a day or two, and sales can reach staggeringly high number. Not of course staggeringly high dollar receipts, but thousands of copies sold of a book which had been ticking over at a few copies a week. Given our rhetorical commitment to getting maximum exposure for our books (rather than making maximal profits) this should be a no-brainer. Never before have we been able to employ pricing that was so easily variable. But let’s just assume (and hope) that book publishing does survive in a digital world, opening the front door more quickly, and also that that world continues to contain a significant quantity of physical books. How will the physical books we print be sold to the public? Booksellers, our traditional interface with the public, are stressed. Tony Sanfilippo, of Penn State UP, is doing his bit by setting up a consignment program with one bookstore, turning the bookstore into a sort of showroom. His post in The AAUP The Digital Digest blog describes the arrangement. Let’s hope it works and that his blog post inspires others to do the same. His post was referenced in the Inside Higher Ed blog in May. Let’s just imagine that this and other measures to save our bookstores do not in fact succeed. Bookselling has always been a narrow-margin business, and losing a significant slice of your business to on-line (whether ebook or print book) could be fatal. In Britain we used to “support” bookstores by the net book agreement, whereby society in effect agreed that guaranteeing a bookshop a certain margin was a culturally important thing to do. I think what went wrong in the book trade was when we saw that books could be merchandized in mass quantities to consumers. The big chain booksellers accentuated that trend which then found its logical extreme in the on-line market. The trouble is that there are two kinds of book trade — Your Big Book of Garden Flowers is never going to have much in common beyond the paper it prints on with The Uptake and Storage of Noradrenaline, but because the money follows the former, the latter has to try to survive in the same environment. And it can’t. There are really two different businesses here — and the second is in trouble. You can shift Your Big Book of Garden Flowers through those big box stores, but when the independent bookstores of this country have given up the sales of the most popular items, and can no longer afford to stock obscure stuff, where is the consumer going to go but to Amazon? At the critical point, whenever that was, we publishers said to ourselves, Barnes and Noble, Amazon, Costco, and the corner bookshop are all basically the same thing — places where you can buy books. We debated, and ruled-out, setting up e-retailing sites of our own which could have competed with Amazon in its early days. Now we have to admit that they are not the same thing at all, and face the consequences. Without independent bookstores (in my hypothetical scenario) how is the customer going to see what a book looks like so that he/she can evaluate whether or not to purchase. I dare say The Uptake and Storage of Noradrenaline doesn’t need to be hefted in your hand before you decide to buy — you either need it or you don’t. But having a look at a belles lettres book or a historical study might well be something you’d want to do before laying down your money. So where are publishers going to find their showroom? This is where I propose that the library comes in. If we accept that books are a cultural good, and we need to maintain their distribution for the general good, that kind of support through taxation is most easily achieved by calling the already existing library system into play. Libraries are already selling things, and a few already have Espresso Book machines. They don’t have to sell books — just provide a place where people could look at them before ordering them on-line (i.e. pretty much the way lots of people regard bookstores today). Because their central raison d’être is different, the fact that they don’t make the sale might be less of a concern. Open access is a threat which libraries and publishers both face. One response could be showrooming — settlements are going to be made by governments and this could be part of them. Of course publishers have also managed to pick a fight with libraries over the lending of digital books, but this sort of tussle is only a symptom of the troubled times we are living through. Make common interest and these issues will be sorted out. When a book becomes an ebook, the function of the cover/jacket changes. Originally a protective barrier, the cover/jacket has evolved into a protective barrier which is primarily a marketing tool. You want a jacket with lots of oomph, so that people seeing it in a book shop will be unable to resist picking up the book. Of course once they’ve picked up your book they are, we hope, well on the way to being hooked. Ebooks don’t depend on this visual come-on. Discoverability is the main thing — we want keywords and classificatory terms in the metadata which will enable searching successfully to land on your book. Whether the cover is brilliant or awful is unimportant until such time as the customer has discovered the book, and even then may not be amount to too much. When we get on line the book cover is reduced to the status of an icon. Amazon does wants a cover image, and publishers strive to comply, but the thumbnail you see on Amazon’s site is not very striking. Sure you can enlarge it a bit, but even so, it remains rather unimpressive. If you do have a cover image up there, it had better be right, otherwise Amazon will cancel the sell button till the image has been “corrected”. Just last week we had one taken down because the old cover image mentioned a CD which was no longer available in the book. The book itself now carries no mention of the CD on the cover, and includes a note explaining it is no longer available. This take-down is fair enough of course: conflicting information shouldn’t be allowed to get out there. The craziest cover images are these of books which don’t in fact have a jacket — just foil stamping on the spine. In other words the front cover is blank: check out 0521210437 on Amazon. I’ve had trouble with one of these when we switched the book to a preprinted cover, with type and an image on it. Amazon didn’t like the fact that it was no longer the simple wordless dark blue rectangle which the world had seemingly learned to love. Things have to match. These examples apply to the physical books of course, being sold in an on-line environment, but the same thumbnail jpeg image will attach to the ebook manifestation of the book. When I look at my library in my iPad Kindle app, or in iBooks, I see an array of these small images. Of course, if you have a black & white reading device, all cover images will naturally be black and white only. When you open the book you are generally taken straight to page 1 of the text. You can go backwards through the front matter (prelims) and eventually arrive at this same cover image, but who does? I think this neatly indicates the importance of the cover in the whole package. This piece by Craig Mod provides a thoughtful discussion of designing covers for a digital world. Large type, clearly and strikingly presented, seems to be the key. We are just at the start of figuring all this out though. We (I anyway) tend to think of book jackets as a relatively recent invention. One is vaguely aware of rather plain pre-war jackets, and it is probably reasonable to date the fashion for embellishments on jackets such as embossing, foil stamping, die cut holes, spot gloss etc. to fairly recent times. Even lamination is a relatively recent phenomenon. In my early days in this business jackets seemed all to be printed by letterpress, and tended to be of typographical, rather than graphic design. The Bibliographical Society of the University of Virginia has published Book-Jackets: Their History, Forms, and Use by G. Thomas Tanselle from which (according to the review in The Times Literary Supplement of 4 May, 2012) we can learn that “forms of protective book covering” can be traced back to the 18th century, and began to become common with the introduction of cloth binding in the 1820s. Obviously jackets tend to get destroyed well before the books they cover do, so we are likely to be unfamiliar with the jackets of 19th century books, but it seems that some did indeed have them. The first International Book-Jacket Exhibition was held in 1949, so a concentration on the aesthetics of the jacket may be what is the recent development. I’ve no doubt that jacket design has changed a lot: in that connection Chip Kidd’s recent TED talk may be of interest. Disappointingly moiré does not result from the work of Swiss photographer, Ernst Moiré, eponymous hero of this book. More prosaically the word derives from the word for watered silk or other materials. 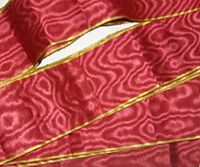 For those of you who weren’t around in Victorian times, moiré silk is a weave which when viewed aslant against the light shows a shifting wavy, watery pattern. It’s also called moire, and given that it appears to be an English word in origin (Chambers relates it to mohair, which was apparently also woven in this manner) the accent is probably a late addition, to make the word seem more exotic. Having spent some time involved in the woolen trades, I find this sort of up-classing of terminology entirely convincing. We were always calling things names which sounded classy and might one hoped justify an up-charge. In the graphic arts moiré is altogether undesirable. The Wikipedia article is rather good I think in spite of the qualifications which someone has added at the top calling for documentation and criticizing the way it’s written. We come across moiré patterning usually when we submit as original artwork a photo cut from a newspaper or book. An already printed photo will carry its original screen, and when it gets rescreened for your publication there’s often (usually/always?) a conflict between the two screen angles which sets up a pattern of darker and lighter areas regularly spread across the picture. 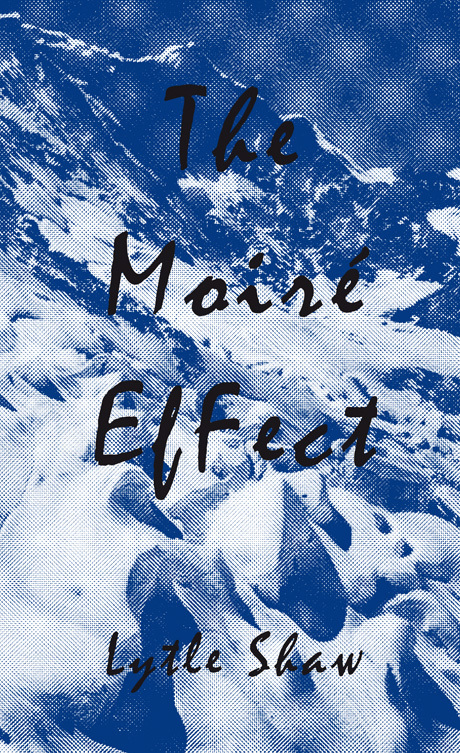 The book cover illustrated above incorporates a moiré pattern which you can see well in the sky. This illustration from the Wikipedia article shows the effect in action. This angle difference is what makes your screen finder work. When you lay its radiating lines over a halftone the pattern of interference will give you the screen value of the halftone. Smyth sewing (note no “e”) is now quite rare, but when I started working in the industry probably about 90% of books were bound this way. Now only de luxe books and books from smaller university presses are being sewn. Sewing is done after the signatures have been gathered (and if it’s a hardback, after the endpapers have been tipped to the 1st and last sigs). The operator picks up each sig in sequence and places it over a saddle-like structure with holes in the middle to allow a series of needles to come up and penetrate the back fold of the sig. Immediately the next sig is placed over the saddle and sewed to the previous one. This continues until you have a complete book block joined by threads. Indeed it continues immediately after too, as the next book is lightly joined to the previous one in a continuous process. In hand binding sewing is done with a needle and thread. Smyth machines automate this process, but sewing is still a labor-intensive process. 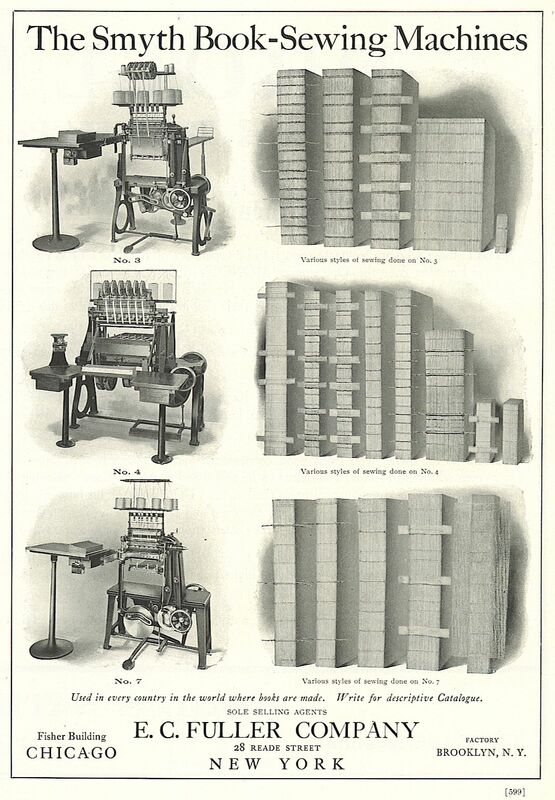 Because of this, it became an early target for those attempting to bring greater efficiencies into the bindery. 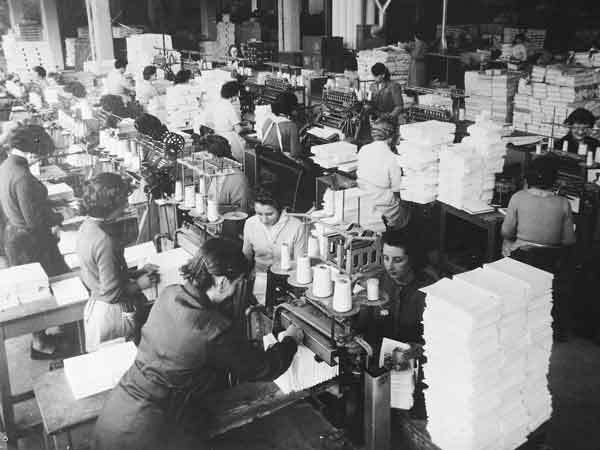 One by one the big book manufacturers closed their sewing departments in an attempt to cut cost out of the process to respond to the demands of their customers. Smyth sewing has the reputation of being the strongest form of binding, but this is a bit of a sentimental myth, I believe. Sewing will eventually loosen up, but it does tend to stay good and tight for a long time. It’s not that it is un-strong, it’s just a matter of how you define strength. The strength of a chain is its weakest link, and in a sewn book the “weakest link” is the center four pages of the sig, where you can see the threads when you open the book. Page pull and flex testing (they have little machines that do this in a controlled manner) will cause the thread to tear through the paper quite quickly, so that the center four pages come away from the book. Other forms of binding, e.g. notch binding and even perfect binding will out-perform a sewn book in this test. It can be argued that page pull and flex testing doesn’t represent real-life wear and tear on a book. It also test books just off the binding line, and the adhesives are fresh. 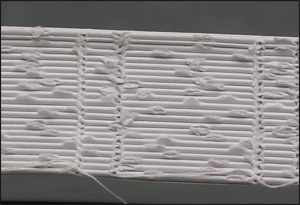 Obviously the outer leaves of the sewn signature are much stronger than any page in a perfect bound book, and the average strength of all the pages must be much higher in a sewn book. It’s just that in the perfect bound book no pair of pages will be weaker than the weakest foursome in the sewn book: but no leaf in the perfect bound book will be stronger than any other. Anyway Smyth sewing isn’t the strongest way to bind a book, however you measure. I don’t know what really is, but side sewing must have a good claim to that title. Smyth sewing is the way we’d ideally like to see our books bound: we all regret its passing, while eagerly participating in killing it off by demanding ever cheaper prices.